An over-zealous cleaner at the Ostwall Museum in Dortmund, Germany, has ruined a piece of modern art worth £690,000 after she mistook it for an eyesore that needed a good a good clean. The sculpture, by German artist Martin Kippenberger, called When It Starts Dripping From The Ceiling, had been on loan at the museum when the cleaner made her terrible error. 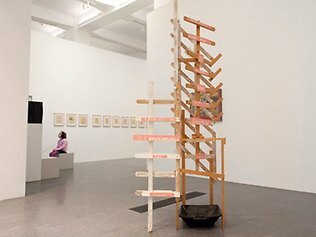 As you can see from the photo, the sculpture is a tower of wooden slats with a rubber trough underneath it with a thin layer of beige paint representing dried rain water. Thinking this was an actual stain, the cleaner scrubbed the surface with a scouring pad until it gleamed! “It is now impossible to return it to its original state,” a spokewoman for the Mmuseum said., adding that the damage had been discovered late last month and that the sculpture had been on loan to the museum from a private collector. She also said that cleaners had been sent a memo ordering them to stay at least 20cms away from all the exhibits, but it was unclear if the cleaner – who worked for a company to which the cleaning had been outsourced – had received the memo. Kippenberger’s not the only artist to have their work ruined by cleaners, he’s actually in very good company. 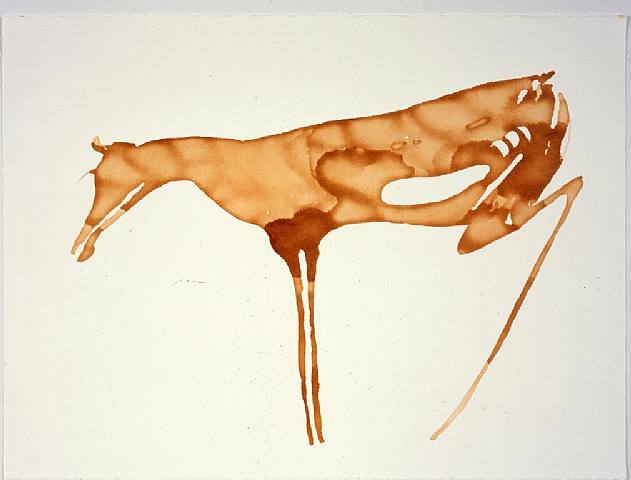 In 1986 a “grease stain” by Joseph Beuys valued at 400,000 Euros was mopped away by a cleaner at the Academy of Fine Arts in Düsseldorf. In 2001, English artist Damien Hirst lost a load of beer bottles, ashtrays and coffee parts from the Eyestorm Gallery in London, after a cleaner cleared them away, unaware that they were part of a piece depicting the life of an artist. 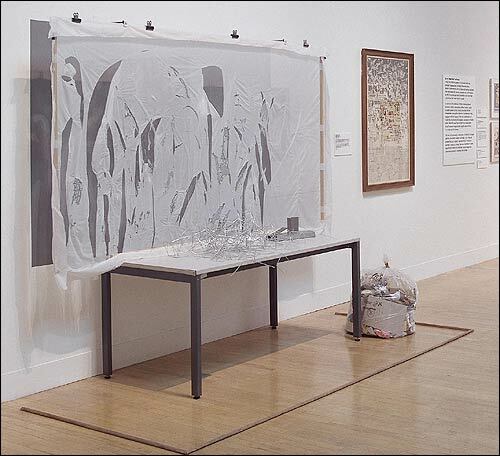 And in 2004, a cleaner at Tate Britain chucked away part of a work by another german artist, Gustav Metzger, after he’d mistaken it for a bag of rubbish. The cleaner didn’t realise that a plastic bag full of discarded paper and cardboard was an integral part of Recreation of First Public Demonstration of Auto-Destructive Art. The bag was later recovered but was too badly damaged to be put back on display, so it Metzger replaced it with another bag.